Jim was born in Chicago IL to George Ernst and May Hochel Fuller, joining brother Ronald. He attended St. Philomena’s School and Lane Tech before his family moved to California, settling in Altadena CA. He graduated from Elliott Junior High and Pasadena High School. Like his father and brother, he joined the Electrical Union becoming a journeyman electrician, working in this trade and as a contractor for over 40 years. But his real interest was classic cars. He restored hundreds of cars to mint condition. He was a part of the local car scene, showing his Buicks, Cadillacs, Fords, and race cars. He also became a remarkable chef, enjoying French cooking ,tri-tip barbecues, and inventing his own recipes. 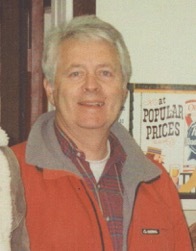 Jim was a kind gentle man with a dry sense of humor and many friends. Jim leaves his wife of 55 years, Barbara, three sons Chris, Gary, and John , their wives, 11 grandchildren, a sister-in-law, 1 niece, and 8 nephews. He loved his family. His brain was donated to the Multiple Systems Atrophy Research, Mayo Clinic, Jacksonville, FL. Funeral will be 11:00 am, Dec 23 2015 at Our Lady of Mt. Carmel Church, 1300 E. Valley Rd., Montecito. A reception will follow in the church hall. In lieu of flowers, please donate in Jim’s name to Visiting Nurse & Hospice Care, www.vnhcsb.org, Parkinson Association of Santa Barbara, mypasb.org, or Our Lady of Mt. Carmel Church, mtcarmelsb.com.